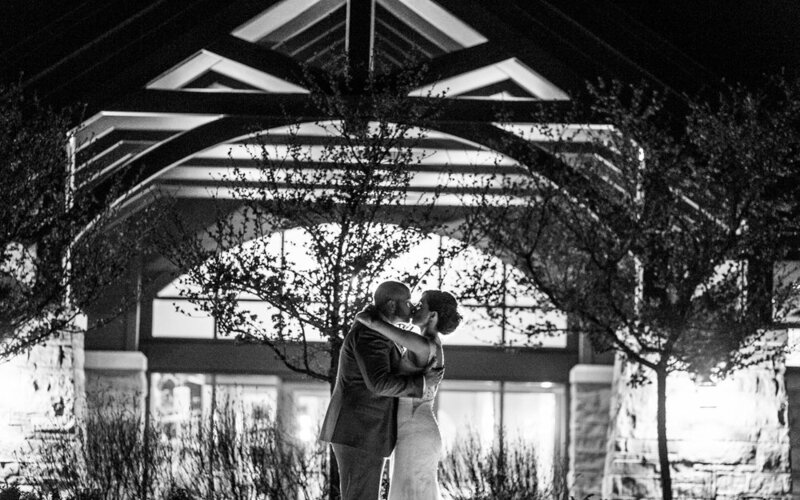 You're engaged, have chosen a gorgeous wedding venue at Flamborough Hills Golf Club, and are ready to dive into the details of making it the prettiest and most fun day in the history of ever. Below, you'll find information on what's included with your package, how the process works, and what you can expect on your big day. The decor package includes luxury linen for the head table, cake table, receiving table (card box, guestbook, seating chart), and the large wood table in the front foyer. Typically, the front foyer table is used for welcome signs, photos of you two, and/or a memory table with either old wedding photos or honoring those who can't be with you on your wedding day. Since the table isn't going anywhere and it's such a gorgeous piece, I always recommend putting it to use for your big day! Use it however you like; I'll have a linen runner and candles ready to go to accent whatever you bring in. 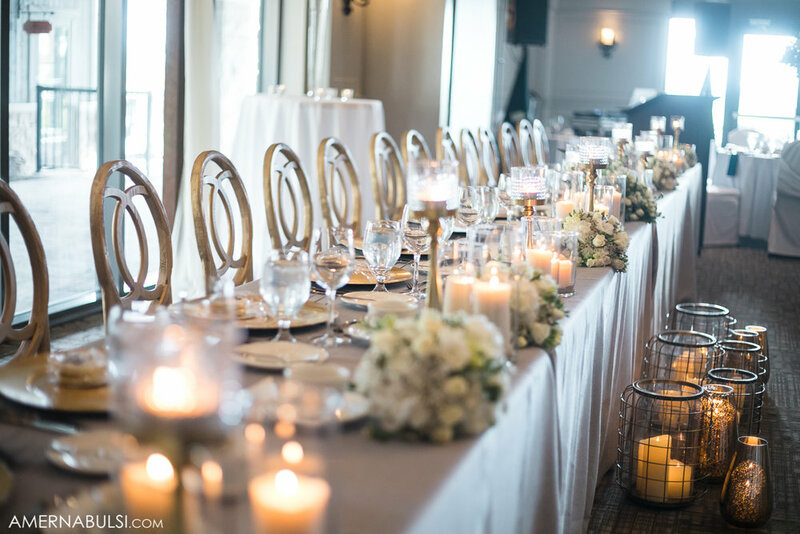 As far as decor, there are many types of candles for the head table (you'll get to choose your favorites at the table mockup meeting! ), cardbox options, lanterns, and other items* that can be brought in for you. In addition, gold or silver charger plates (the decorative plate that your real plates get put on) are available for your head table. *some other items may be an additional charge. Please contact Anna with questions, ideas, and brainwaves. If your ceremony is on site, it's safe to say I'll have a goofy smile on my face and a tear in my eye as you say your vows. Sorry not sorry; it's one of my favorite parts of the day! 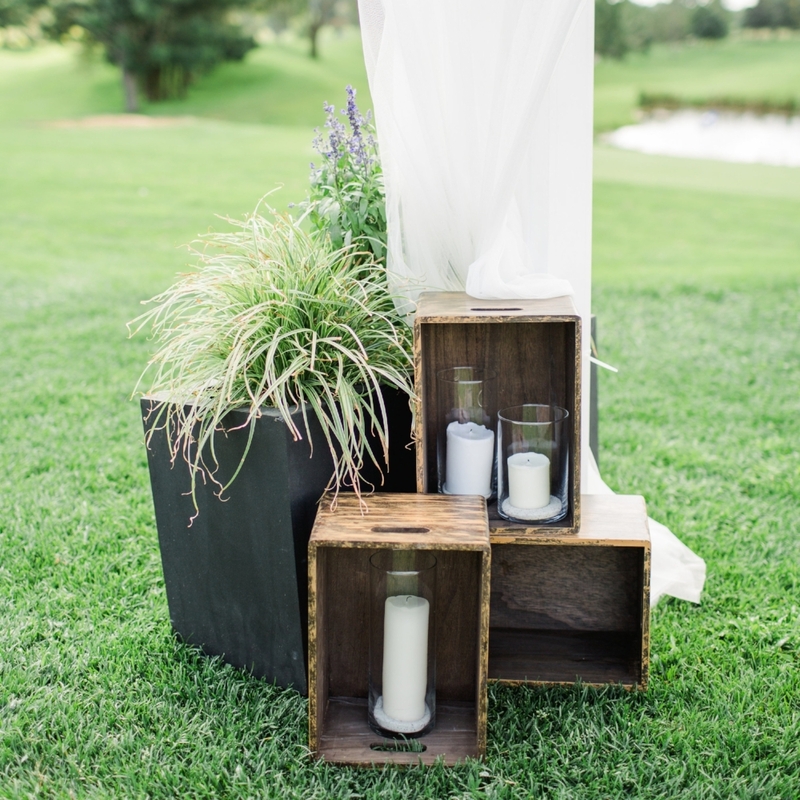 Included with your ceremony package is the wooden arch with custom white draping, "reserved" signs for the family rows, and altar decor like lanterns, wooden crates, and candles. Large floral installations will be covered by your florist, but let me know your ideas, and we'll talk about them! Additional items such as wine barrels are an additional charge and custom welcome signs or "choose a seat, not a side" signs are typically brought in by the couple. I'll happily display anything you'd like to bring in to include. Let's talk about what you want, and I'll get you quotes. Some things don't cost as much as you think, and there's no harm in getting a quote to see the black-and-white number. After you've got all the information, then make a decision. When you receive your Client Portal login information, fill out the Design Questionnaire. We'll schedule a Table Mock-up appointment to play with linens and make selections for your big day. I'll put in the orders for your linen and decor. I'll create a design plan for set-up, move things from ceremony to receptio n and take care of the clean up. You enjoy your wedding day without a care in the world except saying "I do!". The bulk of the Wedding Management package pertains to the weeks leading up the wedding. You'll receive extra planning assistance in the form of free tools to keep track of everything and my hands-on help creating the wedding day timeline from makeup starting to the send-off at the end of the night. In addition, I directly coordinate with every vendor you’ve hired to confirm their arrival times, their services, and coordinate with them on site during the course of the day. After confirming with the vendors two weeks before the big day, I then send every vendor the detailed timeline (which incorporates dinner service details that you’ve confirmed at the Flamborough Details Meeting). Flamborough’s venue coordinator is the best I’ve ever worked with as an independant planner; however, they will not confirm the details with all of your other vendors prior to your wedding. As an example, they aren’t able to call a vendor if that vendor is running late or something goes wrong because the golf club isn’t aware of who you’ve hired or what they’re supposed to be doing. Flamborough is my absolute favourite venue to work with, and my Wedding Management package provides an even higher level of peace of mind for the bride, groom, and their families. The team at Flamborough is also able to focus more directly on dinner service if I’m there to focus on and coordinate (with your MC/DJ) the speeches/dances/etc throughout the dinner and after. Forgive my manners! Let me introduce myself. I’m Anna, your Type-A, detail-obsessed clone who will closely manage your wedding day details like it’s my own big day so you can focus on your sweet guy, that new “wifey” title that looks so good on you, and celebrating with your favourite people. With my 10 years in the industry, you can count on me to communicate well and keep things moving just as you’ve dreamed they would.